It’s sort of odd, because when it comes to products like deodorant and toothpaste and mouthwash, I’m not particularly brand loyal. I say that because when it comes to ordering meals or picking restaurants, I’m like a 90-year old man. I get the same sandwich at the same place, the same entree/appetizer combo at the same Italian place I’ve gone to since middle school… I could go on, but you get the point. For whatever reason, that inane stubbornness/refusal to try new things doesn’t apply to the things I’m actually going to be using most*. Recently, I had to buy a new stick of deodorant simply because the type I’d been buying for a year or so is no longer sold at the places I shop. So, I went with Mitchum. Or Mitchell. Whatever, that’s not the point. The point is that after I’d applied it to my underarms after a workout later that day, I thought I’d bought a new cologne. Either that or all of my pores had been replaced with miniature aroma factories. All through the rest of that day, I’d get a whiff of my new self and smile. It was like I’d bought a new body. 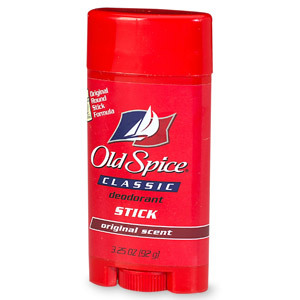 Side note: For you gents out there… you ever try women’s deodorant? Back when I lived at home some years back, I had to use one of the extras from the linen closet after mine ran out. Turns out it was a women’s stick and I have to say, the coverage was incredible. Not to mention, I smelled like I’d just got finished sleeping with a girl. Polar Opposite of this Feeling? : Being excited about your new scent, raising you arms in said excitement and seeing the dreaded pit stain. *I’d argue that’s why I’m so stubborn. If I’m only going to the restaurant every so often, why waste the one time I’ll be there with a new dish when I know what I love. I can hear my mom arguing with me.